Geese. Why did it have to be geese? 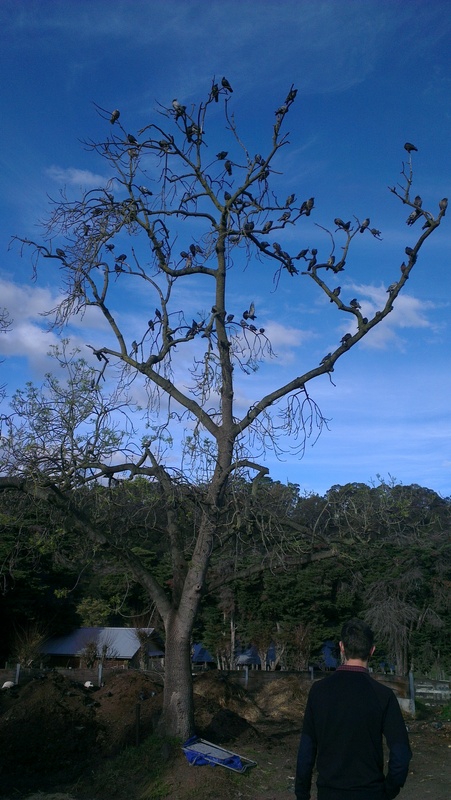 I was alarmed by the large, long-necked birds. Someone in my family once told me of a story from their childhood, and how they had been intimidated by geese at a farm… in fact geese tried to attack this family member! Do you know how they retaliated? The family member in question was never bothered by this avian kind AGAIN. Can you see how detrimental it is then that this story followed me over to The Big Goose farm, in the Spring school holidays? Why did it have to be geese? And had a look at the great old map to see where we would begin our day’s journey. Due to proximity, it was to be The Big Red Shed. All matter of small farm animals could be found in this petting barn, with keepers around to help with the more delicate of animals, such as young baby chicks. There was even a reptile room with lizards and snakes, for the more slithery-inclined folk amongst us. We then headed towards the tractor ride. It was free and included in the ticket, but we had to wait the span of 20 minutes or longer, as the queue was long, and we watched two truck loads head around the grounds before it was finally our turn. Granted this was only because it was school holidays and a spectacularly sunny day, so I imagine if you were to arrive at a quieter time there would be no delays in jumping on board. It wasn’t the most awe-inspiring of truck rides, but for kids, yeah it was good. ‘Freebies’ are always welcome, and we got to view the camels as we rode past them too. It was generally a ride of the grounds and some passing animals in their enclosures. If you miss it, it’s not the be all and end all. What we did pay extra to do, which I did up at the entry window, was an extra $5 for a pony ride. The line for this is beside the tractor rides, and even though it was fairly cheap, because it was additional the line wasn’t long and soon baby girl was strapping on her helmet. So of course that is what she did. The jumping pillow area has an assortment of tables and green areas for parents to sit and chill while their offspring go psycho. And be assured, there was a ‘Big Goose’ staff member jumping alongside the kiddos, just making sure, you know, things didn’t get out of hand… we don’t want outrageous big jumpers now, do we? … only because after so many activities and time in the sun, I absolutely imposed a shade and food curfew. Lucky us there was a café on site. The Rotunda Cafe houses a variety of day hot specials alongside other lunch regulars, and I got a calamari salad while baby girl got chips. It was nice to be out of the sun for at least a bit, and I had to promise baby girl that we would be back for that ice cream everyone was walking out with. Now this was pretty interesting. The guy running it was very informative and engaging as we sat with the kids watching snakes crawl up his arms, legs, body, the wall… it was interesting yet freaky stuff. Baby girl even got called alongside some other kids to hold this giant long snake’s body, but at the sight of it she freaked out and pulled the pin immediately. You won’t be surprised to hear we soon left and got ice cream. Ha ha. But the show was, really quite good. With our ice creams we now scoured the grounds, free from any activities or set places calling us. We looked into bird enclosures. We went into another petting zoo enclosure and fed A LOT of goats. We appreciated the serenity of the scenery. And we carefully stayed away from all the wild wandering geese on the grounds, more so after observing all the signage telling us to watch out for them! It had been a really full couple of hours, and having not even been there all day, I felt I had already gotten my money’s worth from the (half) entry price. As a final resort, baby girl went into the playground area, which was a crafty set-up of climbing apparatuses, a high enclosed bridge that led to a winding slide, and a grand selection of things to climb, swing, jump and land on. A great play area, in that it was completely enclosed from the sun, and any foul weather on what might be an otherwise cold and rainy day. Many families and parents were set up around this area, as not only did it provide shelter from any elements, but its enclosure meant it was safe. We walked that much faster out of there after remembering the words of a boy from the reptile show, who had kindly offered the nuggets of info that some of the geese had been posed to attack since people were getting too close. Thanks little dude. I needed to hear that. The Big Goose is at 233 Mornington-Tyabb Road Moorooduc. But on the school holidays they are open every day! Check their website at www.thebiggoose.com.au for more info on family entry prices and updated info regarding seasonal entry times. You can buy some kangaroo food and walk through the wildlife park to feed them. You can get wet at the splash park! You can throw a birthday party or host a function. And for super keen Geese, there is even an annual pass you can purchase which will save you loads. There is a lot of dirt and sand around. Closed-toe shoes will save you from dirty feet. Sunscreen and hats are a must in warmer months, especially if you have to wait in a queue at all. A drink bottle won’t hurt either. Watch out for the Geese! With both indoor/outdoor areas, areas to keep all kids, both young and old entertained, with places to sit and eat and relax, this place really is a great one-stop shop for the whole family. And for the price to enter, it is relatively cheap for what you can get if you spend the whole 6 hours there. 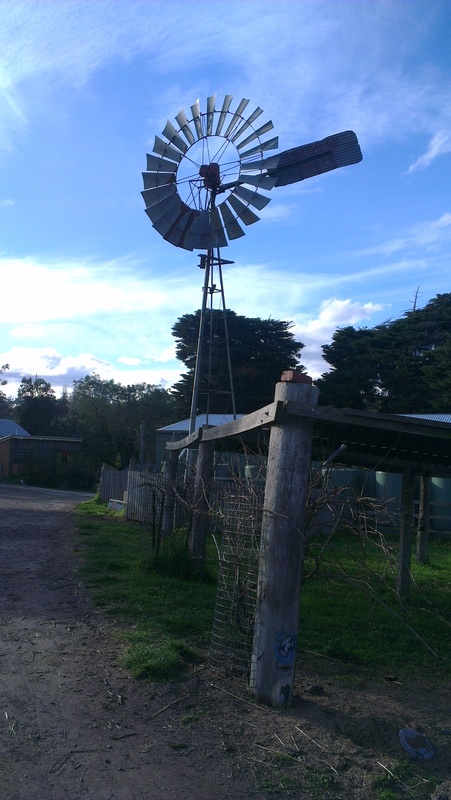 Hectares of park land in city surrounds, where animals are chilled out in their farm life yet the folk visiting come from all high and low ends of the city, is what the Collingwood Children’s Farm is all about. I came to discover this as we ventured out there for the day to celebrate both mine and baby girl’s birthdays. Firstly, getting there. If you’re walking over (fortunate local) or public transporting it down, well you’re doing it the easiest. If you are driving down on a weekend or a sunny day, BE WARNED. Trying to park at the St. Helier Street car park is probably best done when it’s cold, early in the day or a weekday. Since we headed over at lunchtime on one of the first sunny Sunday’s in August, we were met with a formidable line leading up to the car park closest to the farm, with the sign up the front of the car park ‘Full’ not seeming to deter many drivers. If you do happen to find a spot in there, note that the first half hour is free, with fees increasing as the hours tick on. However, this is not relevant on a weekend, which let’s face it is when you’ll most likely go, am I right? Fees all around then. (If it makes you feel better, proceeds go towards the Children’s Farm and the Abbotsford Convent also located there). After circling around blocks for a while, we parked where many others were, on Johnston St/Studley Park Road, but we made sure to park AFTER a certain section (I think it was over the Yarra River bridge heading towards the Studley Park Road part of the street, past a street sign symbol) because a fellow driver was kind enough to point out to us when we parked in the earlier section of road of the many parking fines on all the cars currently parked there. How the others didn’t see it was beyond me. Park desperation = herd mentality. This was a 5-10 minute walk to the farm, made slower by the fact that baby girl was set on walking slowly through the gravel car park we cut through. Entry was $18 for a family. For us this was cheaper than the normal $9 an adult and $5 per child. If you have a concession, it’s even cheaper. Because we wanted to lunch at Farm Café first, we received a stamp so that we could return to the farm grounds later without having to pay again. After our lunch (read the ‘interesting’ account here) we headed around the corner to the farm. We saw chooks, birds, roosters, a peacock, cows, goats, ducks and pigs. 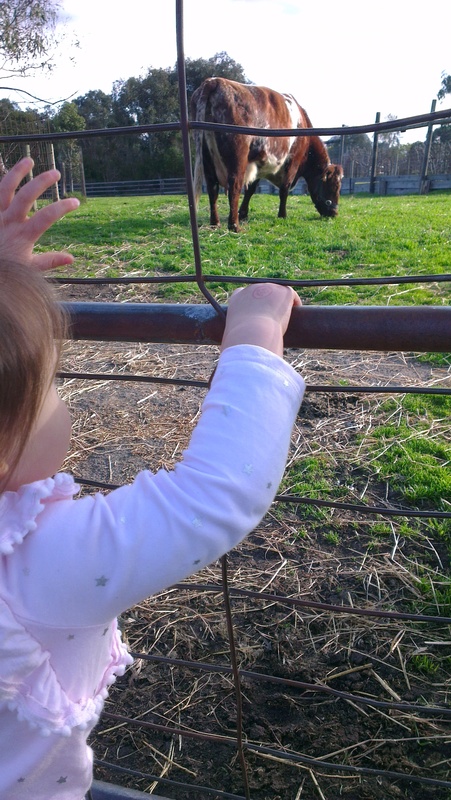 b)	Was much too interested in messing about the gravel dirt underneath her feet (with her hands of course) than the animals before her. It was her birthday, so ultimately she could do what she wanted. Age wise I think it’s a great place for kids a bit older, say 3-4 onwards, as they would probably appreciate the animals more and not be so distracted by random elements (!) 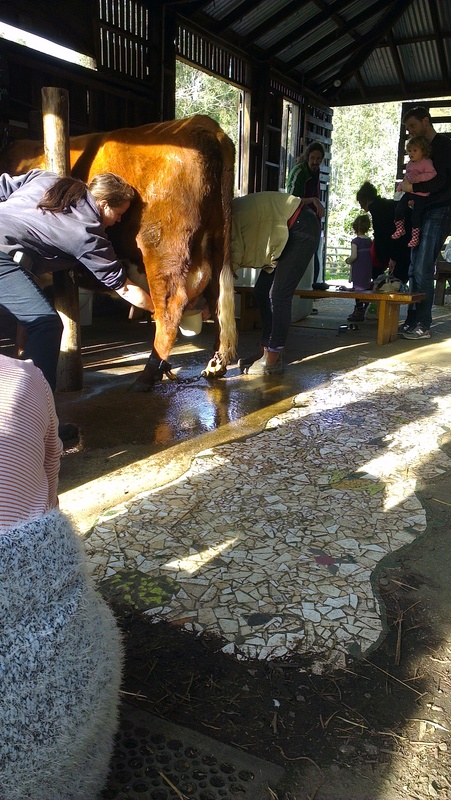 while those a bit older, say 6 up, would appreciate the educational elements: if you’re there at the right time you can even experience the milking of a cow! 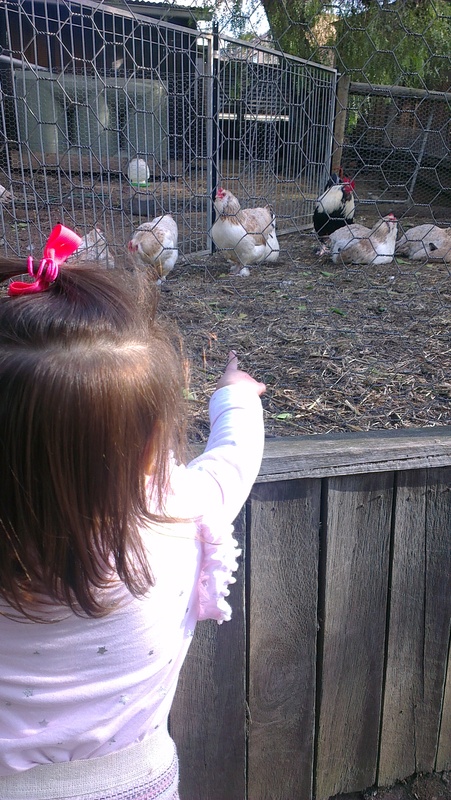 Collingwood Children’s Farm can be visited at 18 St Heliers Street Abbotsford. (Part 3 of our birthday outing can be read here). This seemed like the perfect place for both adults and children. Which is what I was after (and really every other family out there too) but more so, because we were heading out to celebrate baby girl’s and my birthday. 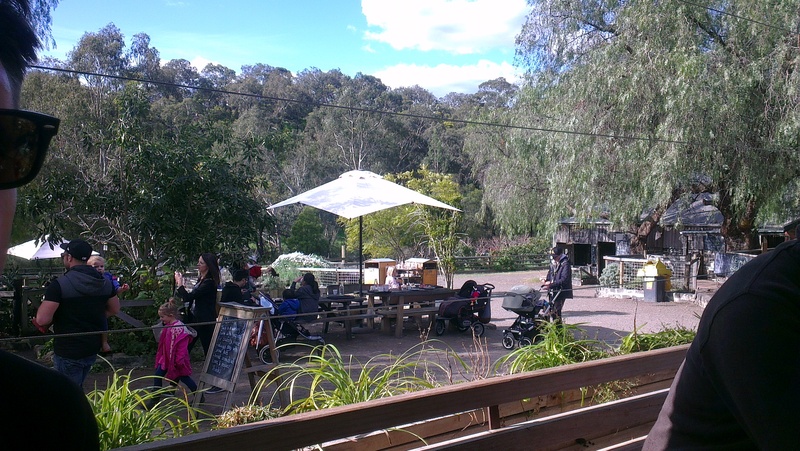 There were meant to be farm animals for the kids at the Collingwood Children’s Farm, and the Farm Café and luscious green surrounds were there for the big kids. I mean really, how could it go wrong? The weather started off right. It was a sunny Sunday in August, the first weekend that we got a real taste of the impending Spring/Summer. I was excited. I’m constantly telling people how by the time my birthday pops around, the winter cold is diminishing and bursts of warmer weather are starting to infiltrate the cold. Maybe because I’m clutching at (Spring) straws; maybe because I’m defending my birthday month; maybe because I’m right. This day had me smiling in pleased confirmation again. With much focused staring and stalking, we finally found a park along Johnston St/Studley Park Road, and proceeded to walk on over about 5-10 minutes to the farm. (Click here for more info on parking there). 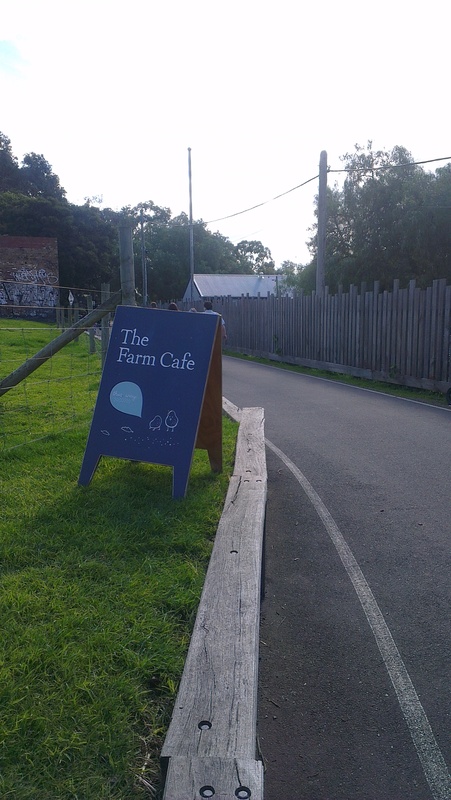 We chose the family pass of $18 to get into the farm, and received a stamp allowing us to first go into the café, before exploring the farm grounds. You can solely attend the Farm Café without payment, because the café is positioned and set in such a way that you can’t eat and then sneak through into the grounds without the entry fee. You can look from there, but you can’t touch. We went straight to the café knowing that there might be a wait post 1pm, and sure enough there was. We received a buzzer that would inform us when it was our turn to be seated, and while we waited I took the opportunity to explore with baby girl and take photos of the surrounds. It didn’t end up being the half hour wait as told, perhaps a bit less. We sat down in an open area that was still covered, amidst tables tightly crammed next to one another, with views looking out to the farm beside/below us, of chickens roaming about, and a peacock doing a casual little walk. There was an outdoorsy feel. It was a farm after all. We had to quickly order, as we were now very hungry and I didn’t want our little birthday girl getting cranky on her special day. I was a tad disappointed that I couldn’t get the kids lunchbox (cheese sandwich, a house-baked treat and a piece of fruit) for baby girl, but they had run out. Instead I swapped the poached egg for fried, removed bacon and added a slice of cheese, which they quite simply placed on the side of her dish. It was fairly uncreative, really. 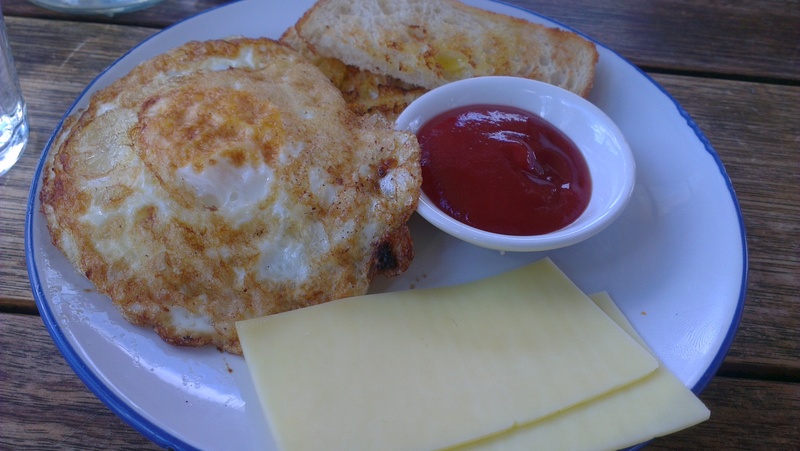 They could have at least put the cheese, on top of the bread, under the egg, so it melted slightly. Mine and Hubbie’s meals looked ok, but in the end they were nothing special. To be honest, they were below average and fairly bland. 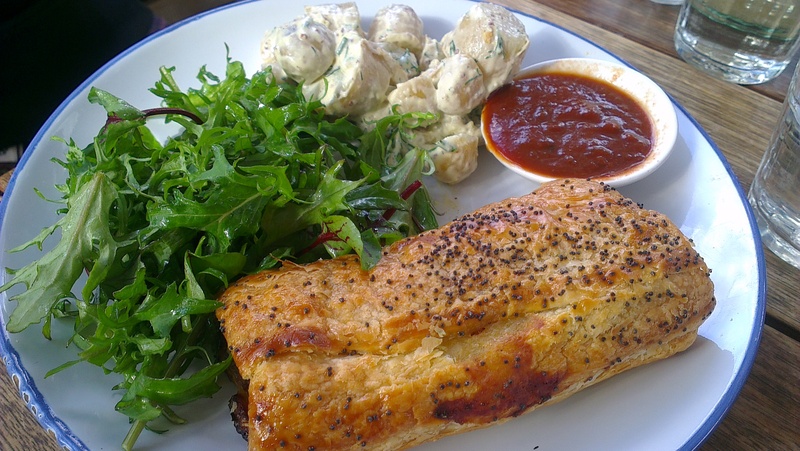 My mushroom pie had no other discerning or interesting taste to it, all I could taste was mushrooms as I bit in. Don’t get me wrong, I LOVE mushrooms. 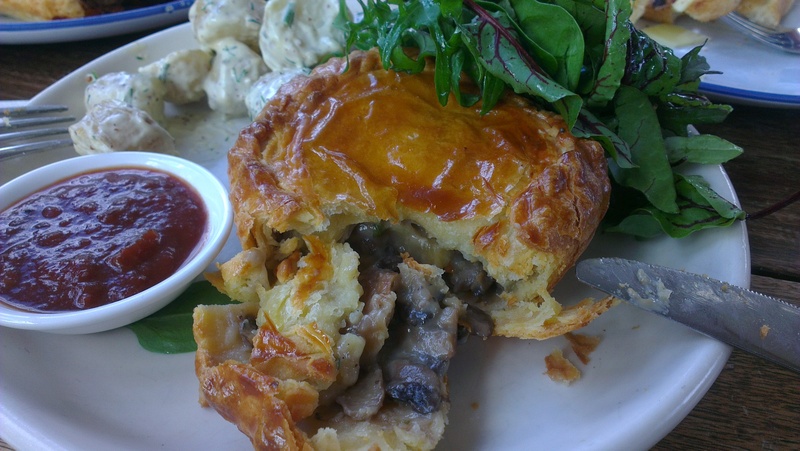 I just expected the sauce or gravy of the pie to have some hint of salt or flavour in it, to further complement the earthy mushrooms. None. The accompanying potato salad was rather standard, again nothing special. Hubbie felt the same about his meal, and the only reason that we ate it without much antagonism was because we were spending a lovely day out for our birthdays, we were in such a good mood, and we were hungry. That was it. Baby girl’s meal was very standard, and I concur that most children’s meals out there tend to the ‘plain’ side, but this, with the cheese placed on the side as if it was just tossed there, took the meaning to a whole new level. She also like us was hungry, and ate most of it. Following that meal, we were almost uninspired, tending to just head out and not worry about a drink. However Hubbie had some kind of surprise location planned next, (link) and kind of hinted that we may have some kind of drink there, but didn’t say what kind. I assumed it was coffee, so suggested we get hot chocolates at the Farm Cafe instead (again, the weather and the day and our birthdays was saving the Farm Café’s arse). 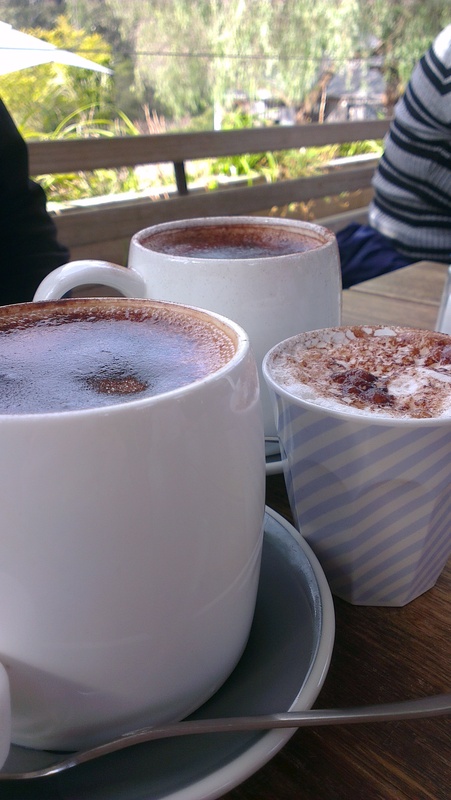 We each got a hot chocolate in a mug, and baby girl got her necessary babycino. The hot chocolates were huge! They were served in mugs, tasting mild and softly sweet, which I didn’t mind, but I think Hubbie would have loved a more sugary, sickly-sweet hit. Baby girl happily drank all of hers, leaving chocolate stained marks on her face. But alas, it was a rather plain babycino, mostly milk and little froth, making the fact that I don’t believe they charged us for it (there is no babycino on the menu) more than adequate. Food: 4/10. Below average. Nothing made me want to try anything else, and I just felt the lack of food quality and presentation let down the beautiful location and serene atmosphere of the adjoining farm. Coffee: N/A, and I’m not overly bothered I missed out either. Ambience: As mentioned above, it has a very relaxed vibe. The surroundings were calm and placid, best enjoyed on a sunny day, which is fortunately what we had. People: There were generally those with kids there, but I also saw duos of friends, younger couples, and older couples. I think the location brings a variety of people there, but most prominent are the families. Staff: They were ok. Again, nothing above average, they weren’t rude or anything, but they didn’t really give us any smiles or necessary attention. They were busy though, so I’ll give them the benefit of the doubt on that one. Price: It was about $50ish, and I say ‘ish’ because the lady up at the counter kept our receipt so I have to go off the prices listed on their website. The hot chocolates were the only half-enjoyable items. The rest made the total bill not worth it. Had the food been up to scratch, it would have been. 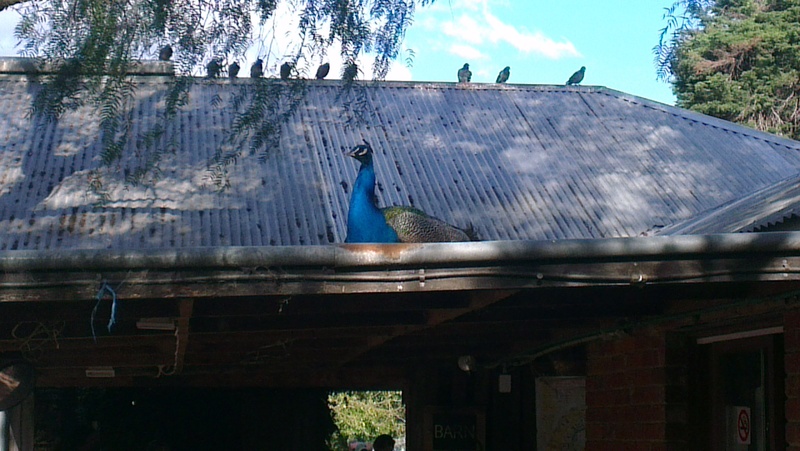 Advice: If you are going to the Collingwood Children’s Farm, save yourself the hassle and eat elsewhere. You probably won’t have to waste time waiting for food that is below par. If you are seriously not fussed with food, well then you probably won’t mind the quality of it. Perhaps the breakfast options are better. 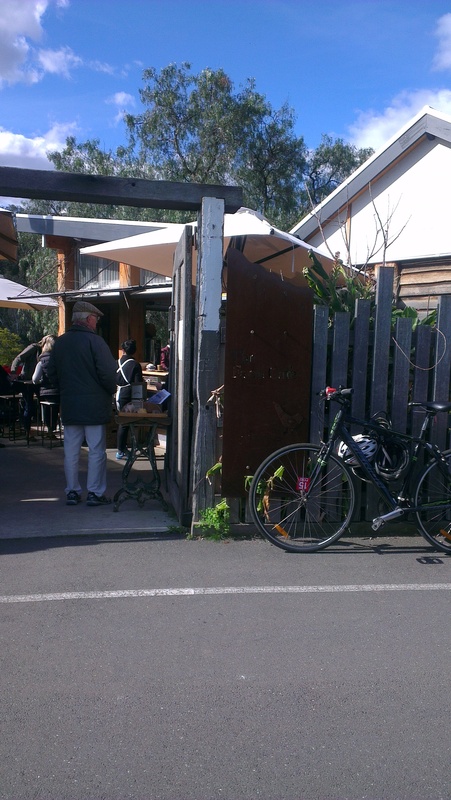 In a nutshell: The Farm Café should consider itself very lucky. I said to Hubbie very early on into our lunch that day that the only way it was surviving was due to its location and proximity to the Children’s Farm. It was not surviving based only on the food, because if so then on that day we wouldn’t have found the café there at all, just remnants of what used to be one. Which is a shame, when I think of people I know who have put much effort and money into their own little works of art café creations, and poured so much research, energy and time into an amazing menu and superb coffee, only to have to close due to the people in the area NOT WANTING TO SPEND THE MONEY ON QUALITY. It’s sad, yet true. And here is a very average café with such a high turnover that their kids meals run out, who are able to ‘produce’ the kind of food that we got that day, and they still keep on going on, solely due to the high paying folk of the area and their fortune in being alongside an animal farm. I am really surprised. I hold no malice, yet based on our first and only experience there, Hubbie and I will most definitely not be going back to the Farm Café.